How to I travel to Rocky Point? It’s an easy and scenic drive, with well maintained roads all the way. It takes 4 hours from either Phoenix or Tucson. Please visit our map page for more detailed information. Do I need a passport or Mexican visa? Yes, if you are age 16 or over you will need a passport or passport card to re-enter the US. For children age 15 and below, a birth certificate official copy is sufficient. Please visit the CBP website for details on US immigration requirements. As for entering Mexico, Rocky Point is located within the Mexican border zone therefore no visa or any other travel documents are needed. Do I need Mexican auto insurance? Yes, at minimum you need to have Mexican liability coverage in order to drive legally in Mexico. You can purchase online or at one of the insurance agencies along AZ85 around Ajo or Why. Purchasing collision or comprehensive coverage is optional. What is the procedure to cross the border? On the US side, there is a border patrol checkpoint where they will ask if you have any weapons or large amounts of cash. Do not attempt to take any firearms into Mexico! Then you proceed to the Mexican immigration checkpoint—as you drive through, if you get the green light just continue on your way. If you get the red light, pull to the left into one of the inspection booths where the agent will ask some questions and may inspect your vehicle contents. What items may I bring across the border? Generally you are fine to bring normal items with you that you intend to bring back. Laptop computers, tablet PC’s, smartphones etc. are OK. As for food and alcohol, check at https://www.gob.mx/senasica to confirm the current regulations. In general, the rules for bringing food/drinks into Mexico are similar to the rules for bringing the same items back into the US…uncooked meats or poultry, or vegetables and fruits, are generally a problem. Up to 1 liter of spirits per vehicle occupant over 21 is OK. If you are bringing motorized vehicles such as watercraft or quads, be sure to have ownership documents with you. What is the drive like from the border to Rocky Point? Mexico highway 8 is a well maintained 2-lane road with broad shoulders. Posted speed limit is 90 KMH (about 55-60 MPH). Speed limits in the border town of Sonoyta and also within Rocky Point are very low, we suggest you adhere to the posted limits in town where enforcement is strict. Where will I park my vehicle while at Las Palomas? Each condo building has convenient underground parking so you can unload your car close to the elevator that will take you to your condo. Additionally, you can take comfort knowing that your vehicle is parked in a secure shaded area. During checkin, you will be given a parking placard for your vehicle which must be displayed while your vehicle is at Las Palomas. Do I need to change money into Mexican pesos? Rocky Point has often been called “Arizona’s Beach”, and due to the very large American population you will find that US$ are generally accepted. Be advised that you may get change back in Mexican pesos however. How is the Las Palomas resort security? We have a large security staff at Las Palomas, ensuring that only legitimate guests or owners gain entrance to the resort property and also to monitor the pool areas so that any unsafe behavior is stopped. All guests wear wristbands during their stay. Are there medical services available in case I become injured? In the event of injury, Las Palomas has medically trained emergency response staff on hand 24/7 and in addition there is an Urgent Care clinic less than one mile away. For a more serious issues, Rocky Point does have a hospital. Is your condo a timeshare? No! 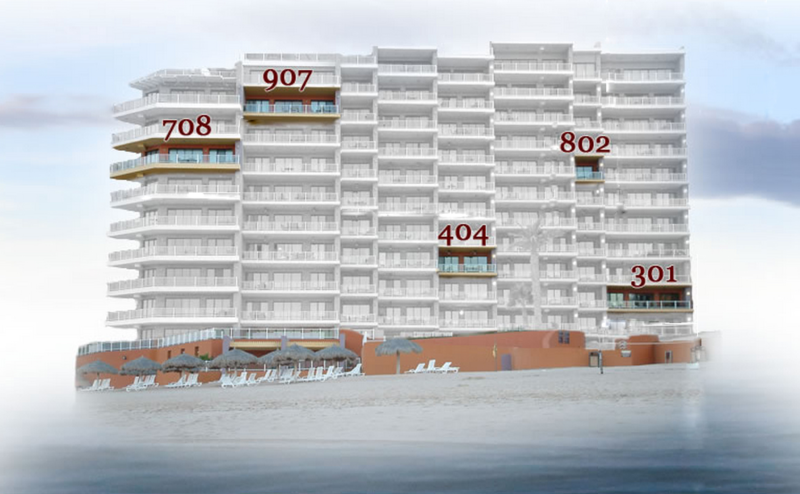 We have full and direct ownership for our condos at Las Palomas, which follow the “condotel” model. This means that each condo is individually owned and furnished, but the resort offers hotel services including check-in desk, maid service, room service, restaurants, etc. just as you would expect from any 4-star hotel. How is your condo furnished and equipped? In order to rent your condo at Las Palomas, the owner must meet minimum standards for furnishings. We’ve gone far beyond those minimum standards with the objective of delighting our guests with opulence and comfort during your stay in our beach condos. Do I need to bring my own towels or bed linens? Not necessary. All linens and bath towels are provided. Daily maid service is included, and while towel reuse is encouraged to save resources you may get fresh towels on demand with no extra charge. Pool towels are also available in the pool area. How do I check in when I arrive at Las Palomas? Las Palomas is a guard-gated community; when you first arrive just ask the guard where to find the check-in desk that is most convenient to your condo (there are two desks). Then, as with any hotel, there are check-in desks where you get condo electronic key cards and a wrist band which allows for resort charges and pool towel rental. Is there internet and phone service available? Each of our condos at Las Palomas has a dedicated fiber optical 30Mbps internet connection and the fiber optic router broadcasts wifi internet using the common 802.11n format with both 2.4GHz and 5.0GHz connections available. The routers are password-protected to ensure that the bandwidth is reserved for your use during your stay – the access password is provided prior to your arrival and is also written on the router. Internet service is complimentary, there are no fees charged for access. Phone service is available, free worldwide outbound calls can be made from the phone that is attached to the router and there is a Cisco dataphone which can be used for condo-to-condo calls or to contact resort services. How is the TV service? Las Palomas offers a wide variety of satellite high-definition channels which include 5 local Arizona stations, and most channels are in English. All of our condos are 100% equipped with flat panel wall-mounted TV’s for your viewing pleasure. We also provide a Yamaha Bluetooth sound system in the living room and BluRay players in each room. Is there a way for me to enjoy my own music at Las Palomas? Several ways, actually. First, we equip each of our condos with a Yamaha Bluetooth stereo system connected either to Klipsch or Polk tower speakers. Second, there is a portable Bluetooth speaker tower system which you are free to move around to any room or to the balcony. We hope you enjoy listening to your own music while staying at our Las Palomas condo. How can I secure my valuables while I am at the beach? Each of our condos is equipped with a digital safe box same as you would expect in any hotel. Yes! In addition to the regular water supply to the condo being treated to US standards, our condos are equipped with reverse-osmosis water filtration systems which provide pure drinking water to the kitchen sink as well as to the icemaker. Does your condo have air conditioning? Yes! In fact we have recently invested in high-reliability Trane air conditioning equipment for each of our condos to ensure that our guests enjoy their beach vacation with no concerns about condo cooling. Las Palomas provides daily housekeeping services, unlike other Rocky Point beach resorts which only clean your condo after you leave. What happens if we experience a condo maintenance problem? Our aim is to keep our condos immaculately maintained so that you can enjoy your beach vacation without any hassles. In the unlikely event that something goes awry, Las Palomas will move you to a different condo of similar floor plan and location with no extra charge to you. Will I need to pay any fees when I check in? No! Our quote is the full amount including taxes and fees. You owe nothing more to the resort other than any food or drinks you may choose to purchase. Is the electrical power the same as in the US? Yes, you can bring any US appliance or electronic device with you and it will work perfectly in our condo. What activities and amenities does Las Palomas resort offer? Just about anything you could imagine doing on a beach vacation is available. Las Palomas is one of only two Rocky Point resorts with a golf course, so bring your clubs! Of course the beach is the main feature—we are located on Sandy Beach, the nicest and most swimmable beach in Rocky Point. A unique feature for our beach is extreme tidal swings which is a boon to shell-seekers. Besides the beach, Las Palomas has an amazing array of pools, hot tubs, and lazy rivers at your disposal. Feeling hungry or thirsty? Two pool bars and two restaurants are at your service. Over-indulged and feeling a bit guilty? We have a fully-equipped gym where you can go work off a few of those tacos. Rocky Point weather is similar to Phoenix or Tucson but more temperate due to proximity to the ocean. Meaning, not quite as hot in the summer nor as cold in the winter as compared to Phoenix or Tucson. The Sea of Cortez ocean water is much warmer than Southern California; our swimming season extends from March 1 to Nov 30 (but some more hardy souls swim year-round). How is the golf in Rocky Point? Amazing! Rocky Point golf is a best-kept secret. Besides the superb Las Palomas Links golf course, Rocky Point has two Nicklaus-design courses to challenge your golf skills: Laguna del Mar (Cholla Bay) and Peninsula (Mayan Palace). Please visit Golf Rocky Point to get more details about Rocky Point golf. Are there jet ski or quads available for rent? Yes! As the largest and most popular resort in Rocky Point, several jet-ski rental operators are on the beach in front of the resort. Quads are not permitted on Sandy Beach but rentals are available nearby so you can explore the expansive sand dunes between Sandy Beach and Cholla Bay. How can I arrange a fishing charter or Bird Island trip? Several fishing charter operators are located at Old Port. You have a choice of a small no-frills “panga” fishing boat or a larger and more opulent boat—depending on your budget and how many people you have in your party. Bird Island tours can be arranged through several operators – you can check with the Las Palomas desk staff on how to set this up. Yes! During off peak season, at least two pools are heated (one in each Phase) along with hot-tubs. Additional pools are heated during high-occupancy periods, and during May-Oct all pools and lazy rivers are comfortably warm for swimming. May I bring a cooler to the pool area? Guests are not permitted to bring coolers to the pool areas. You may bring an insulated bag as an alternative. At the beach there are no restrictions on coolers. May I bring recreational vehicles (quads, bikes, boats) and is there secure storage? Yes, this is permitted however recreation vehicles will not be parked in the underground garage—the staff will advise you on arrival which secured outside parking area to use for your recreational vehicle. What are some restaurant recommendations? Rocky Point is a foodie paradise. Jacques Cousteau called the Sea of Cortez “God’s Aquarium” and so the seafood is amazing as you’d expect. Just about any dish with flounder or shrimp will delight your palate. Please visit our Dining page for some specific restaurant suggestions. What restaurants does Las Palomas offer? La Maria is located on the ground floor of Rubi building in Phase I and Citron is located in the Phase II convention center. Check with the resort on arrival to confirm hours of operation for each eatery. Las Palomas also operates two pool bar restaurants (one in each Phase) which serve both cocktails and bar food. Is there a convenience store at Las Palomas? We have a convenience store on the basement level of Rubi building at the rear of Phase I. Is there a grocery store in Rocky Point? Several. The closest one is Ley’s grocery store, only 10 minutes from Las Palomas. Ley’s takes credit cards and US dollars. Can we cook our own meals in the condo? Absolutely! This is a big advantage in renting a condo. While you will want to enjoy some of the restaurants in Rocky Point you can also choose to keep cost under control by cooking most of your meals in the condo. Each of our condo kitchens is equipped with full size oven, glass top range, side-by-side refrigerator with icemaker and door dispenser, and dishwasher. Small appliances include blender, microwave oven, toaster oven, drip coffee, and Keurig K-cup coffee machine.